Home / Modern Pest Blog / What Is IPM And How Does It Benefit Homes In New England? What Is IPM And How Does It Benefit Homes In New England? IPM techniques are used to keep New England homes pest free. When it comes to protecting your home from pests, you can trust that the team at Modern Pest Services is committed to an Integrated Pest Management (IPM) approach to pest control. But many homeowners across New England may wonder, what does IPM mean? In the past, many pest control services were reactive – wait for an infestation and then spray chemicals to rid the home of pests. But in today’s world with a focus on being environmentally friendly and protecting our families from the overuse of chemicals, many pest control programs have adopted more proactive IPM techniques. IPM is a broad approach that focuses on many different aspects of pest control rather than just the random application of pesticides. The main goal is to eliminate pest problems before they occur which requires efforts from both homeowners and pest management professionals. 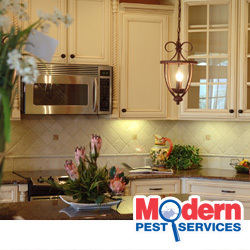 There are many different components of an integrated approach to pest management and at Modern Pest Services you can count on a customized program to best suit your home’s pest control needs, led by trained and licensed pest managment professionals. Prevention – Finding ways to avoid pest problems before they happen such as pest-proofing your home. Monitoring – Non-chemical monitoring devices installed by the pest control pros to watch areas that are most likely to have a pest infestation. Education – Learning the signs of pest infestations so you can identify a problem before it gets out of hand. Inspection – Both homeowners and pest management professionals should perform regular inspections of the property, both inside and out, and watch for any signs of pests. Treatments – When there is an infestation requiring treatment, the pest management professional will be sure to provide your home with the least toxic and most effective treatment plan. In most cases, it requires careful application of pesticides as needed, but in some cases, it’s completely chemical free. To learn more about Modern Pest Services IPM approach for homes, please contact us today! We provide home pest control solutions for residents in Maine, Massachusetts and New Hampshire.